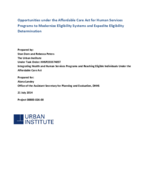 Opportunities under the Affordable Care Act for Human Services Programs to Modernize Eligibility Systems and Expedite Eligibility Determination. 45 CFR §155.260 Privacy and security of personally identifiable information. Federal Register: January 5, 2000 (Volume 65, Number 3) Federal Register: July 28, 1998 (Volume 63, Number 144) Federal Register, Wednesday, January 13, 2010, 42 CFR Parts 412, et al. EXECUTIVE ORDER #12866 - REGULATORY PLANNING AND REVIEW EHR Payment Incentives for Providers Ineligible for Payment Incentives and Other Funding Study. Appendices. (a) Creation, collection, use and disclosure. (A) Substantive requirements. The Secretary may approve other uses and disclosures of personally identifiable information created or collected as described in paragraph (a)(1) of this section that are not described in paragraphs (a)(1)(i) or (ii) of this section, provided that HHS determines that the information will be used only for the purposes of and to the extent necessary in ensuring the efficient operation of the Exchange consistent with section 1411(g)(2)(A) of the Affordable Care Act, and that the uses and disclosures are also permissible under relevant law and policy. (4) Description of how the information to be used or disclosed will be protected in compliance with privacy and security standards that meet the requirements of this section or other relevant law, as applicable. (2) The Exchange may not create, collect, use, or disclose personally identifiable information unless the creation, collection, use, or disclosure is consistent with this section. (viii) Accountability. These principles should be implemented, and adherence assured, through appropriate monitoring and other means and methods should be in place to report and mitigate non-adherence and breaches. (5) The Exchange must monitor, periodically assess, and update the security controls and related system risks to ensure the continued effectiveness of those controls. (6) The Exchange must develop and utilize secure electronic interfaces when sharing personally identifiable information electronically. (b) Application to non-Exchange entities. (ii) Collects, uses, or discloses personally identifiable information gathered directly from applicants, qualified individuals, or enrollees while that individual or entity is performing functions agreed to with the Exchange. (v) A provision that requires the non-Exchange entity to bind any downstream entities to the same privacy and security standards and obligations to which the non-Exchange entity has agreed in its contract or agreement with the Exchange. (C) Any existing legal requirements to which the non-Exchange entity is bound in relation to its administrative, technical, and operational controls and practices, including but not limited to, its existing data handling and information technology processes and protocols. (f) Compliance with the Code. Return information, as defined in section 6103(b)(2) of the Code, must be kept confidential and disclosed, used, and maintained only in accordance with section 6103 of the Code. (g) Improper use and disclosure of information. Any person who knowingly and willfully uses or discloses information in violation of section 1411(g) of the Affordable Care Act will be subject to a civil penalty of not more than $25,000 per person or entity, per use or disclosure, in addition to other penalties that may be prescribed by law.